Did you know there is a practically free method of obtaining plants for your home or back yard garden? Does someone you know have an african violet, begonia or other house or garden plant you admire? Just ask for a cutting. Chances are your friend will be flattered and more than happy to oblige. There is a nearly unlimited variety of flowering plants and shrubs that will easily propagate from stem cuttings. A good general rule is to take cuttings from newly produced tip growth when it is at the stage where it snaps when bent, usually in late spring or early summer. 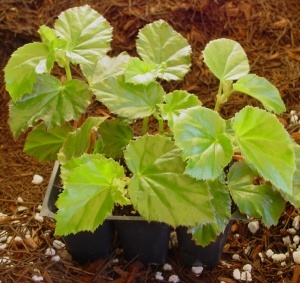 Cuttings of plants with succulent stems, such as begonias or african violets will even produce roots in plain water. Successfully propagating plants from leaf or stem cuttings is a rewarding project and stimulants which further healthy root growth can be a great help. The hormone 'auxin' promotes root growth and is the basis for most commercial rooting hormone. These usually are packaged in a powder form which goes a long way, and are relatively inexpensive. Auxin is an element contained in willow trees. It is easy to make your own rooting compound by gathering a few willow branch leaves or tips. Chop them up and soak overnight in water. Strain or remove pieces and you have your rooting hormone. If you don't have access to willows, dissolve a couple of aspirin in water. Aspirin contains willow bark and will have the same effect. Another widely employed method of rooting cuttings is to coat the stems in honey. Dip the leaf or stem cuttings in the mixture and put in flats or pots filled with damp potting mix which you have prepunched with holes to receive the cuttings. When using commercial powdered hormone preparations on your cuttings, be careful not to scrape it off when inserting them in the potting mix. Lightly tamp down the pots or firm the new cutting with your fingers so that soil makes contact with the stems. To conserve moisture, cover containers with plastic, leaving a small opening for circulation. Keep in a warm, light area out of direct sunlight. New root growth should be apparent within 2 to 3 weeks and your new little plants are ready to go into their own individual pots, flats, or directly into a special place of your back yard garden.